In Your Dotage, Do You Want A Human Or Robot Helping You? Some people are worried that unthinking, uncaring robots will be part of our future. They are concerned about a Cylon uprising or maybe a Terminator, but that is unlikely to happen any time soon; there hasn't been a true advancement in artificial intelligence since the early 1990s, all we know is that the brain is a lot more complicated than making faster CPUs, regardless of what Ray Kurzweil sells to the public in books (and now from a nice gig at Google also). So robots intelligent enough to really have an impact on our lives are not coming any time soon, but that's okay, we aren't ready for it. We're not even ready to let them answer the door. It seems there is an "uncanny valley" when it comes to more than girl robots and creepy Christmas movies(1). It also applies to caregiving and social situations - about some jobs in that area anyway. Nurses and nurses assistants seem to welcome some robotic assistance - when it comes to mundane tasks like walking patients and doing housework. Presumably that would go for bedpans too, when we are talking about caregiver housekeeping. And I imagine a whole lot of patients probably feel the same way. Georgia Institute of Technology did a survey and found that over half of healthcare providers would rather have a robot than a human; we know why that is. For lower cost jobs in an increasingly expensive country, the quality of human you are going to get is likely going to be low. The days when buildings could afford to hire elevator operators are long gone and that means true quality is rare in lots of lower paying jobs. Robotic helpers will have narrow, well-defined tasks but the quality assurance is built in. Reminders about medications - sure. Suggesting medications - not welcome. And caregivers wanted to keep some things as human contact that might seem surprising; helping people dress, bathing them and feeding them. It might make sense to ask patients on that one too; I'd be much less self-conscious around a robot on all of those things if I were in a situation where I needed a caregiver. "One open question was whether healthcare providers would reject the idea of robotic assistants out of fear that the robots would replace them in the workplace," said Tracy Mitzner, one of the study's leaders and the associate director of Georgia Tech's Human Factors and Aging Laboratory, in their statement about the findings presented at the ACM SIGCHI Conference on Human Factors in Computing Systems in Paris. "This doesn't appear to be a significant concern. In fact, the professional caregivers we interviewed viewed robots as a way to improve their jobs and the care they're able to give patients." They needn't worry. Health care is one of the few areas where competition increases costs - if Hospital A gets a new MRI machine, Hospital B will need to get one. But the market is too small to have price competition. So it goes with robots. And salaries are not going to go down because a robot takes away menial work, caregivers will likely feel like they are doing more things for more people that can really help. And if the hospital does not have to pay for sick days and vacation pay and health care, so much the better. A robot that can help lift a patient is obviously a lot more reassuring than a 100 lb. nurse trying to do it - or even a 200 lb. one. Old people may not give a darn about Twitter but if they had a robot to do some laundry or clean the kitchen, they would love technology. It's not happening any time soon - the NSF funded a towel-folding robot and it takes 20 minutes to do just one - but it's a good roadmap for the future. Since older people are the ones most likely to need ongoing care, their acceptance is crucial. And they seem to accept it. 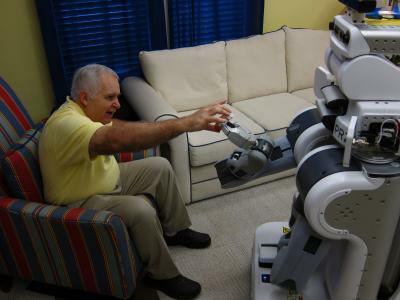 Last year when the Georgia Tech group showed older people (aged 65 to 93) a video of what robots do, their acceptance for tasks almost identically matched that of caregivers. Robots needn't be just for housecleaning tasks. Why couldn't a robot help with a computer science class? Even in the early 1980s, while I had one interesting computer science professor, the rest might as well have been robots. Modern students agree: A survey about a robotic curriculum showed that students enjoyed it the same and got just as much out of it. Men and women reacted no differently, one of few instances where genders agree. So bring on Rosie The Robot - but I'll light my own cigar, thanks. And no nagging me about it, machine. I already have a wife.